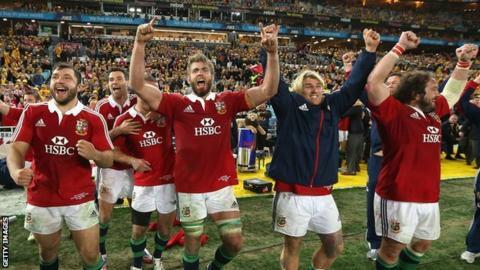 The schedule for the British and Irish Lions tour of New Zealand next summer has been called "ludicrous" by leading figures in the English club game. The Lions play 10 matches on the tour, with the first game taking place at the start of June, just a week after the Premiership and Pro12 finals. "It is ludicrous they are playing 10 games," Saracens director of rugby Mark McCall told BBC Radio 5 live. "No-one talks about it, because it's the Lions, and the Lions are special." Lions chief executive John Feehan said the schedule is the same as 2009 and 2013 in terms of number of games and timing of the opening match. Do they have to have 10 games? Could they start a week later?" A number of Saracens players are set to be included in the Lions squad, and McCall is concerned about the physical impact the schedule could have on those involved. "It's going to be tough, and something that needs to be looked at," he insisted. Because of the schedule, the Lions will have limited preparation time and will be forced to fly out in separate parties, with those involved in domestic finals travelling to New Zealand in the week of the tour opener. The third and final Test against the All Blacks takes place on 8 July, when clubs will be starting pre-season training ahead of the 2017-2018 campaign. The Wasps boss Dai Young - a former Lions prop - agrees that the schedule is incompatible with the oft-stated priority of player welfare. "It seems a bit dull really to have the first game [on that date], when they know the finals are in place," Young told BBC Radio 5 live. "I'm a big supporter of the Lions, it's a fantastic thing which I was lucky enough to experience, and it's something that should be kept on. "But do they have to have 10 games? Could they start a week later? "I know what it meant to me as a player, and I'm sure they can give New Zealand a run for their money. "But if our players are lucky enough to go, what are we going to pick up at the end? Players are going to need a lot of patching up." Feehan said: "The season structures have been set in place for many years and the period between the end of the domestic/European season and the first tour match is the same as it was in 2009 and 2013. "Likewise, the number of matches (10 games in New Zealand in 2017) was agreed with Sanzar [governing body of Super Rugby and The Rugby Championship in the southern hemisphere] a long time ago and is the same as the 2009 and 2013 tours. "Ideally we want as much preparation time as possible but the domestic and European season is complex and we understand the pressures on clubs, provinces and regions who are hugely supportive of the Lions." Listen to 5 live on Tuesday evening from 1930 BST for a comprehensive preview of the Premiership and Pro 12 seasons. James Haskell and Jamie Roberts are among the studio guests.